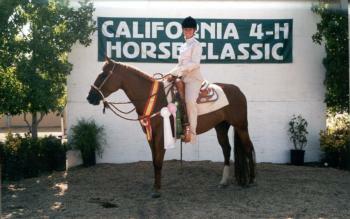 4-H Contact: Shauna Bond, sabond@ucdavis.edu (530)260-3277. This event is the qualifier to attend the Western National Roundup held each year in Denver, Colorado. Educational contest includes individual and team demonstrations, public speaking, horse bowl, hippology, and horse judging. 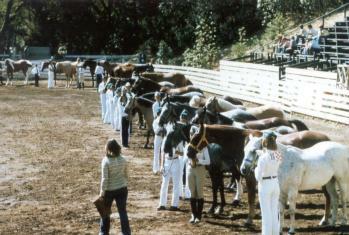 The Horse Show includes English, Western, Gymkhana, and Jumping. A question and answer quiz game of horse facts. You can easily copy the file and then delete/add questions/answers on this PowerPoint program. This guide helps leaders and members learn what they need to know about the 4-H horse project. Through the project, you will learn horse behavior, mounting and dismounting, proper and safe techniques when handling a horse, and general riding techniques. This list of questions is made available to encourage and assist younger members to participate in the horse bowl contest at the local, regional and state levels. All state and national horse bowl/hippology questions are drawn from these sources. Safety is an important consideration in all 4-H projects, including equine. CEH is dedicated to advancing the health, well-being, performance and veterinary care of horses through research and education. This site is a national online program for horse enthusiasts. Their mission is to promote excellence in safety and education for the benefit of the entire horse industry by certifying instructors, accrediting equine facilities, and publishing educational resources. You can purchase the CHA Horsemanship Composite Manuals and other resources on this site. This learning laboratory kit is designed to provide hands-on learning. It enhances the teaching and learning exchange by supplying stimulating and fun activities. All kit parts are designed to be clear, concise, and durable. Posters, charts, prints, and situation/task statements are laminated. Welcome 2018-2019 Equine Planning Team! For more information regarding the team, please visit here.